Robert Dawson, an agent of the Drug Enforcement Agency, is sent to Afghanistan to stop the flow of heroin made from the country’s biggest crop, opium. With the help of Kate Conway, a freelance journalist, and Vizier Ashraf, a shadowy Taliban leader, Robert is disguised as an opium field hand. In Helmand Province he learns the secrets of the Afghan drug trade, and illegally enters Iran with his “boss” and a fifteen-year-old chemist. The principal buyer is known as The Scorpion. A sale of 25 kg of heroin is completed and traced to New York City, where a bust is made. Furious, The Scorpion orders Robert captured and executed. Robert’s father, General David Dawson, is in Tehran on assignment with the International Atomic Energy Agency investigating Iran’s use of nuclear energy. Learning of Robert’s reported execution, he vows to assassinate The Scorpion, who is also a provincial governor of Iran. 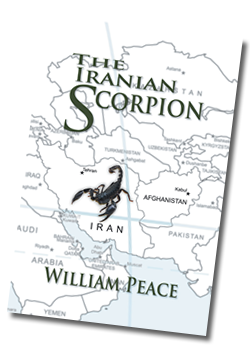 Intrigue and surprise dominate the conclusion of the fascinating story The Iranian Scorpion. William Peace is a retired business executive and management consultant. He is American, is married to an Italian chef, has traveled widely, and lives in London. This is his fourth novel.